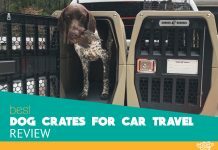 Eight top rated pet carriages for small, medium and large dogs reviewed. Even if you want to go hiking or running, we have the right pick for you. Let's start! It might seem unnecessary to buy a dog stroller, but actually, it could be of great help in many circumstances to change your and your pet’s life style. A stroller brings the possibility of taking them with you, practically anywhere without worrying about your pet’s safety, especially when it comes to an elderly friend who needs special attention or a vet visit. Inclement weather, hot pavement or snowy days are perfect occasions to enjoy having one of these. It’s important to pay attention to find the perfect model that connects with your budget and Fido’s necessities. Figuring out which product to buy can be challenging since there are so many options in the market that are why we set this list in search of the very best models. If you are more of a biking person you can get one of our recommended dog bike leashes or dog baskets for bikes and bring your four-legged friend on a cycling tour. The Pet Gear No-Zip NV is an excellent option for small dogs’ owners, the company manufacturing this product has been in the pet’s industry for almost 90 years, for what they understand the needs and preferences of their customers and can offer you excellent quality and design. Comfort: Pet Gear No-Zip NV is a great quality stroller equipped with a NO-Zip technology to ease a quick access to your pet while he rests in a safe, escape proof place. A cozy Bolster pad is included to make your pup feel pampered and protected during the ride. Highlights: This model comes with rain cover, so your friend can enjoy the view that the panoramic window offers, regardless of daily weather conditions. This model is suitable for jogging or strolling smoothly on rough terrain thanks to the air ride tires, due to these features, it can work as an all-terrain puppy stroller too. Besides, it holds up to 70 pounds so you can even fit two small dogs inside. Assembly/ Stability: Cats and Dogs owners that tried this model commented on its high quality and no problematic construction, it can be easily folded and unfolded for transport or storage. Budget $$$: Sure, this model can be pricey, but it’s worth the money if you are looking for a high-quality stroller that will last for years. This cart is very easy to transport or store without taking much space due to its fully collapsible capacity. Thanks to the three-wheel design you’ll be able to maneuver right through tight places. Comfort: Do keep in mind that this stroller’s capacity is up to 30 pounds, so you can be able of carrying one small dog or two tiny ones. Additionally, the balance of the cart it’s not perfect, so you should be careful. Its wheels aren’t made for every terrain, but unless you are planning to take your dog off-road or on gravel or grass, this model will be ideal for you and your little friend. 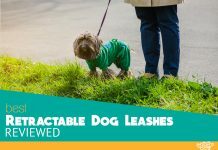 Highlights: The features include three zipper access to get your pet in and out easily and has a top mesh window that allows you to keep an eye on him. A large underneath storage basket for carrying anything you need to take with you, a cup holder and an extra compartment for keys. Assembly/ Stability: Buyers are thrilled to be able of taking their happy pets with them everywhere, they recall the ease of assembling this model and its folding capacity. The stroll will nicely move when pushed, and the mesh windows allow for plenty of ventilation. Budget $$: This is an excellent choice if you are looking for a bargain but still high quality, three-wheeled stroller to ride your petite dog or cat to a walk around the park. If you are looking for the perfect mix of luxury and convenience for a ride with your dog, the DoggyRide Novel is the best stroller choice for large dogs in the market. This model has a sporty-but-classy stylish look, but it’s also a very comfortable and practical option for you and your pet. Comfort: Customers and previous buyers commented the easy access to your pet through the windows, which may be very convenient for ill or disabled dogs. Highlights: One of the main features of this model is its relatively light weight, due to the aluminum-alloy-made frame. At the same time it allows a carrying capacity up to 110 pounds, so you can take one large dog or two medium size ones and yes, this can be a suitable stroller for English bulldogs as well. The cover is designed with reflective striping for added visibility. This dog’s ride includes a pillow for your dog’s comfort, a zip-on rain cover, a water bottle pocket and a backpack to keep anything you need. It’s rubber tires ensure a smooth, pleasant ride for the both of you. Assembly/Stability: Mostly Pre assembled, this model is perfect for those who like practicality and convenience. It rides smoothly and its ideal for jogging. The wheels can be quickly removed, so it’s effortless to fold. Budget $$$: Keep in mind that this model has a high cost and it’s designed for large dogs, getting one of these for a small pet could be overkill. This reliable chariot is made of the highest quality materials making it durable and comfy. Comfort: Shock absorbers are included, so this stroller will prove to be a comfy ride for your best friend. This pet ride features an easy to fold removable wheel design for storage ease. It’s suitable for rough terrain since it includes wheel brakes and shock absorbers for the comfort of your animal. Highlights: An adjustable height handle will also make this cart comfortable to push. It contains a waterproof tray that makes it easy to wash and a tether that will keep your companion in place at all times, windows covered by anti-bug mesh will provide protection and a waterproof roof. Assembly/Stability: Reviewers noted that despite its high quality, going for walks in a city with uneven sidewalks can make the pet cart somewhat difficult to maneuver. If your pet has problems using his legs the unequal distribution of weight can make the ride uncomfortable for the user. We recommend that the passenger doesn’t weigh more than 70lbs if this is the case. In general, reviewers did mention nonetheless that this is indeed a high-quality product and most owners couldn’t find any problems at all. Budget $: This stroller comes with a good Price range which, in this case, doesn’t mean poor quality. Relatively cheap, this high-quality stroller can be used to carry larger dogs. Perfect for Yorkies and sparkly pup’s, this carriage offers coziness and safeness with panoramic views in high-quality rides. Comfort: If you’re one looking for extra comfort for your pet then this stroller is a must. It’s a twin double pet stroller that will give your companions lots of space to move around. Easy access to the inside of this ride is guaranteed as it’s completely zip free! Highlights: As mentioned the carriage is extra wide so be aware of that before buying as it can take more space despite being collapsible, nonetheless you will be able to carry multiple pets, and the extra space will make a very comfortable ride. Air filled tires are featured guaranteeing the smoothest of rides, an air pump is also included. In a case of inclement weather, you can keep your companions safe and cozy with the rain cover included in this product. Assembly/ Stability: Not a light product, but its sturdiness makes it all worth it, this durable carriage will be usable for years! Panoramic view windows will keep your dog’s safe inside, and they won’t be missing any of the action happening outside while you stroll proving to be a delightful ride. We found out that most users are very happy with this product, very easy to maneuver. After certain speeds, the front wheel can suffer from wobbling, make sure to keep this in mind before buying. Also, the air pump seems to be cheaply made, but any actual bike pump can do the trick. Budget $$$: This product can be a pricey option, but the boysenberry color choice comes at a considerably lower price. The BestPet All Terrain Extra Wide it works perfectly as a side by side double pet stroller, and it’s ideal to take over a rough terrain with easy maneuvering. Available in two colors, for you and your little ones to look fabulous at all times. Comfort: According to with reviewers it has sufficient space for the pet’s comfort, and it’s easy to put together. It moves smoothly on diverse terrain. Keep in mind that the carrying capacity of this model is up to 30 pounds and you should not exceed it. Otherwise, the cart could collapse and break up. Highlights: This stroller has a sturdy zipper that makes easier to open de window and gain practical access to the cabin and an anti-bugs mesh that provides ventilation and a great view for the dogs. It also comes equipped with two cup holders; a large basket for carrying groceries, water or anything you need to take with you, there’s also an extra compartment for your keys or phone. Assembly/Stability: This model can very quickly be easily folded and unfolded, so you don’t have to waste time on it when you are in a hurry. 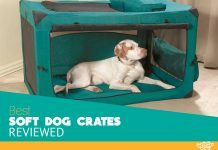 It can hold up to 30 pounds which are suitable for two small’s dogs to be comfortable in it. Budget $: This is one excellent low-cost option for you to take two small pets for a ride. If you want to get in shape and take your pet with you while you work out, you are probably looking for a jogging dog stroller where your dog can rest when he has had enough. Comfort: Booyah Large Pet Bike Trailer serves as both a stroller and a bike trailer, so you can also use it as a stroller for hiking with your favorite fellow. It is both comfy and spacious. Want to ride your bike and walk your dog at the same time? No problem! Attach to the back of your bike and enjoy the ride with your best friend. Highlights: Walk your dog by foot or on your bike, this versatile item lets you choose. Its extra-large size can be a problem so keep in mind to make measurements of any elevators or doors that it might go through. Weather cover is also included. Designed with full windows so your dog can also enjoy the sight while riding. Note that not all dogs will fit, check the dimensions before purchasing to be sure your pet fits inside. Collapsible design allows you to store it easily. Assembly/Stability: This very sturdy, specially made for all kinds of terrain bike trailer is the perfect option if you are looking to go for a ride with your dog. It has shock absorbers on top of air filled tires that will smoothen the ride and ensure the safety and comfort inside the cabin. Reviewers noted that the instruction booklet didn’t come in the package. Contact the seller if you feel the need for instructions, they will send you an email with instructions. Its all-terrain feature was tested, and it performed very nicely in all sorts of terrains. The Booyah is a thick product; please keep that in mind. Budget $$$: It’s one of the highest value offers in the market. 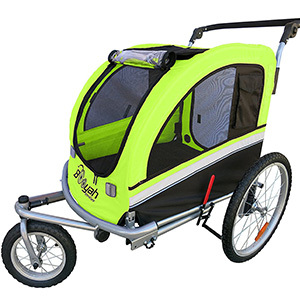 The runner-up top rated option for you to take your pet for a stroll or a bike ride is the “Best Choice Product 2 in 1”, this model serves as a carriage for hiking and jogging, 2 in 1 as it names suggested. It will provide you with the advantages of taking a ride with your dog on what can be both stroller and bike trailer for an accessible price. Comfort: This product is provided with plenty of room for your dog’s comfort and the mesh windows allows the appropriate ventilation. Is also equipped with a water resistance canopy to protect your pet from harmful weather conditions. Highlights: This cart is one reliable, light weight option for you to go on adventures whit your best buddy. It’s designed to support up to 66 pounds, and it can be handily turned into a bike trailer. Also, Several compartments to keep your keys, phone, water bottles or any other belongings safe. Comes equipped with a universal bike hitch to rear axle and flags incorporated allows it to be visible in traffic and reflectors that bring advantages in reduced light conditions. Assembly/Stability: Hundreds of reviewers assure that this is a high-quality product, straightforward to put together and with excellent balance and smooth mobility. It can be easily folded for storage. Budget $$: For a reasonable price, it offers excellent quality and durability among all the other highlights. Just because your dog it’s old, ill or in any way disabled for a walk, doesn’t mean that he can’t enjoy going outdoors with you anymore. They can still appreciate the fresh air and the smell of the trees alongside their human fellows. If leaving him home alone too much time troubles you, this is a convenient solution for you. Go with your little friend everywhere; he will have a safe and comfortable place to rest. It’s handy to ease the carrying of your dog during a walk or training in the park when the outside conditions are less than optimal for your pet’s health. It’s a great alternative for summer days when the pavement’s temperature could cause burns in his cute and rounded paws. In fact, avoid walking him when the ground temperature becomes too hot for your fingers tips. Rainy or snowy seasons usually makes very difficult, if not impossible, to take your pet out. There are so many obstacles to avoid that keeping the right mood can be challenging. A dog Stroller facilitates this task in those days and protects him from the inclement weather. Camping with your dog? Sure! It will be entertaining to have your little fellow with you to appreciate nature. Your pet can be easily transported if he gets tired, plus he will have a perfect place to sleep and be safe from weather conditions during your adventures. Training an anxious dog or cat to go outside can be challenging, a pet stroller is handy in these circumstances, you can just get your pet inside and take a walk with him in a safe place that makes him feel comfortable so he can get used to the surroundings. When walking long distances, sometimes our buddies lack the stamina to follow us, especially small breeds tend to get tired quickly. Exercising with a carriage will provide a space for it to rest happily beside you. During an emergency or a natural disaster, having a stroller will facilitate moving fast with your pet without the extra kennel weight in your arms. This guide will provide you with the top things to keep in mind before you buy a carriage for your pup. Is he small or is he big? A large variety of sizes for this type of product is available, remember to check your pet’s size and compare it to the interior dimensions. Also, you might not want to overkill it, the smaller variety of carriages are cheaper, if you only need a stroller for a little dog then save some money and buy the smaller kind. Facilities: Speaking of size, you do also need to know if your product will go through the doors of your building, or any elevators you might have to go through. This is particularly the case for extra-large ones. While all of the models presented featured a collapsible design, this will only be used for storage. Climate conditions: Weather cover is not always included. You don’t have to worry much about this one, but you and your companion could get caught in the rain. Quality at the best price: Avoid suspiciously cheap products, always go for high quality, remember that this type of product has moving parts that could be broken if they’re cheaply made. Look for sturdiness but also rust resistant materials. Some options can be quite pricey; some products are cheaper in specific colors. This could considerably save you more than a couple of bucks; some products dropped 60$ on their price just because it came in a less traditional color. Stability and comfort: Some of the models presented have more stability than others, in our list, we have mentioned the models that have balance issues, and these problems arise mainly for larger types of dogs, make it double if your pet is unable to sit straight because of any physical condition. If you own a large pet then consider in this case only the extra wide variety, they will have plenty of room to lie on their side without causing instability due to a design issue. Sports enthusiast? The type that can withstand most kinds of terrain is especially those that are meant to be used as a bike trailer. While very large sized, these models are more durable in all sorts of terrain. Ok, I Bought it but How to Assemble? Most strollers need minimal assembly. Only the wheels are removable, and some folding functionality is included for convenient storage, once you’re familiar with the collapsible feature you won’t need to recheck the instruction booklet. Some models although do require assembly, in these cases, the manufacturer will in most cases include an assembly manual on the package. If instructions are not included, it’s recommended to contact the manufacturer. Where are Dog Strollers and Carriage Allowed? Pet’s strollers are allowed in most places; you can go to the mall, parks, and airports. Some famous department stores and shops allow them to Starbucks, Ikea, Macy’s, Pottery Barn, and Lowe’s. Nevertheless, dogs aren’t usually welcome in grocery stores or restaurants, with the obvious and necessary exception of service dogs that, by law, must be welcome any place his visit to provide him the aid and comfort due to their training and abilities. If you are planning a day out with your pet in the stroller, but you aren’t entirely sure he will have permission to enter, contact the responsible staff and ask them directly to prevent any upsetting situation. When it comes to picking the highest quality stroller for dogs, it’s important to know your budget, breed, size and general use. I think that with these eight picks we chose for you, you will be able to choose the one that fits yours and your pet’s needs. Please let us know if you have any questions in the comment section. I bought a Pet Gear No-Zip similar to the one you recommended and I absolutely love it. With 15 y/o and 9 y/o Dachshunds, our walks were sacrificed as the 15 y/o doesn’t move fast and cannot walk far and the 9 y/o is just the opposite. The stroller solved that problem and helped us to really enjoy our walks and time outside. The 15 y/o gets the best of both worlds, time outside with us and still enjoying the sites and scents when we stop at a park or store. The product recommendations, tips, and reasons here are spot on. Thanks for helping to spread the word on how great dog strollers really are! I have been searching for pet strollers which do not have chemicals or labels that say Proposition 65 warning. Most all of the ones I have seen so far have the warning label. Is there a list for finding healthier choices in pet strollers?